← Declawing? Why not detoothing as well? I find the first picture very disturbing. My family has 2 cats and I actually love all animals. I also have 2 cockatiels and I know for a fact it is a very stressing situation for a cockatiel to be watched like that by a predator. It is not right. If you are an animal lover then you should rethink the posting of that picture. Hi Fabiola.. Thanks for visiting and sharing your thoughts. I have thought about this picture and whether it should be on the page as a result of your comment. You make a good point. I think I will leave it on the page, however. The reason is because it is a very good photograph and secondly the situation only occurred for a short time. Thirdly it is a natural scene played out billions of times every year on this planet. It is a very good reflection of cat behavior and the page is about cat behavior. Domestic cats are wild at heart and the photo helps to remind people of that. Some people cause a lot of stress in their cats by treating them as fluffy inanimate objects. The picture might help these people to see an alternative view. We are all stressed both humans and animals alike (and humans are a species of animal as well). To hide something that is natural for the sake of political correctness is wrong in my opinion. Yes, I agree that we should not encourage stress in animals, we should strive for the opposite. I do. And in this instance things were over in about 30 seconds. I hope that it reassures you that the birds were only stressed for a very short time. I also think the occurrence of this is rare in the place where the photo was taken. But once again thank you for taking the time to comment. All comments are welcome. No I don’t think the birds have noticed either but I’m in agreement in that I don’t think birds should be caged. They should be free. The cat is not the issue with this picture, the issue is that someone was cruel and heartless enough to put birds in a cage. Birds in a cage is cruel beyond reason. And having just spent a lot of time with birds in huge aviaries, I can understand why so many caged birds live short worthless lives. People who cage birds, such as the sick person who owns the birds in that photo, seem to think birds are insentient, and are only good for being decorations. I’d live to shove him/her in a tiny cage for the rest of their life, and see how much they like it. 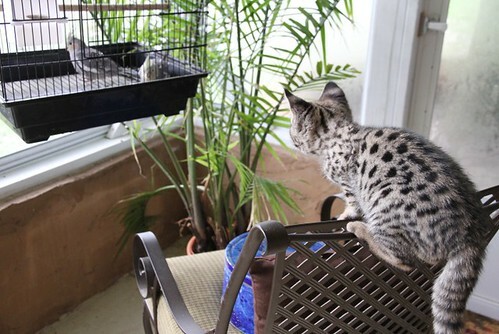 Aug 28, 2011 Disturbing Photograph of a cat looking at a “Caged Bird”. I have two traditional persian cats, matahari and her kitten matata and one of India’s best talking parakeet named “Mittoo” living together in the same huse. Matata is now 2 and a half year old mature tomcat and agressive. He has this habit of sitting on the stool and staring at “Mittoo’s Cage” kept high up on the house gallery ceiling, exactly in the same way as shown in the photograph. According to me, this is a natural instinct in cats as they are carnivorous predators by nature, domesticated by us humans and hence still have these predatory qualities.Always be careful if you have aviary birds and cats as pets, making sure to never let them intermingle as the cat would definitely harm the bird in a majority of cases.I am 100% sure that tomcat matata would seize and catch Alexandrine parakeet “mittoo” if both were left together in the same room, although “mittoo” is the oldest pet resident of my house, having been a pet companion for 19 years. I don’t think the caged bird in the photograph has actually even noticed the cat peeping at him,if the cat was jumping at or on the cage I’d be among the first to cry foul(or fowl)but there’s no harm being done here at all. I agree it’s scary for a bird being watched by a cat, but our family used to have canaries in a big wodden cage in the living room (before we realised how cruel caging birds is!) and our family cats used to hunker down on top of the cage, cats unconcerned by canaries and canaries unconcerned by cats, so although I agree wholeheartedly that yes it’s cruel to allow or encourage cats to stalk caged birds, in some cases an unlikely cameraderie can spring up between the two species. Bird watching is a natural part of a cat’s life which indoor cats are deprived of but they never lose their instinct for. Nature has become all messed up with birds being caged and cats being kept indoors. There are people who moan about cats killing birds, then sit down to roast chicken or turkey without a thought that it was once a living creature. The hypocrisy of those people is sickening. I feel for the caged birds in the picture and I also feel for that cat, it’s all wrong, but it’s part of the way the world is now and why hide it ? Why let people bury their heads in the sand when that picture might provoke some thought about what we are doing to Nature ! Hello Fabiola, I tend to side with Michael on this – the photo is simply an illustration of what happens every minute of every day in nature. As for ‘re-thinking’, it does strike me as odd that you are upset that your two birds get stressed by the presence of your own two cats; is this a situation that you have ever considered having a re-think about?